Winter – it’s that season after you take down the tree and before you can break out the flip flops. It’s all about snowy stuff, you know… snow flakes, ice skating and snow men (which I have an irrational fear of – not the real ones, but the little snowmen statue things creep me out!) After an over abundance of color all Christmas, I was craving a little more bright white after it all came down. 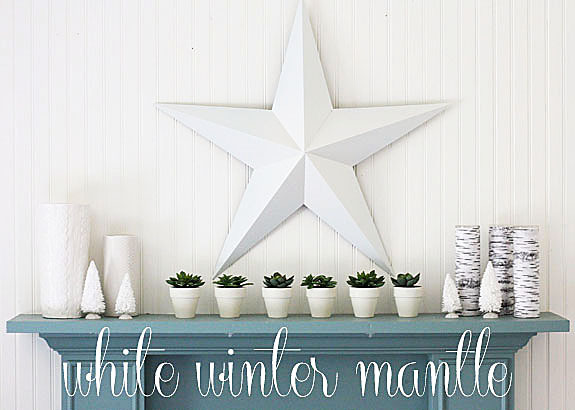 I just popped my big white barn star on the wall, and got a little creative on ways to fill it all in to create this white winter mantle. I started with a couple of random vases, the cable “knit” one from Target, and the honey comb from West Elm. 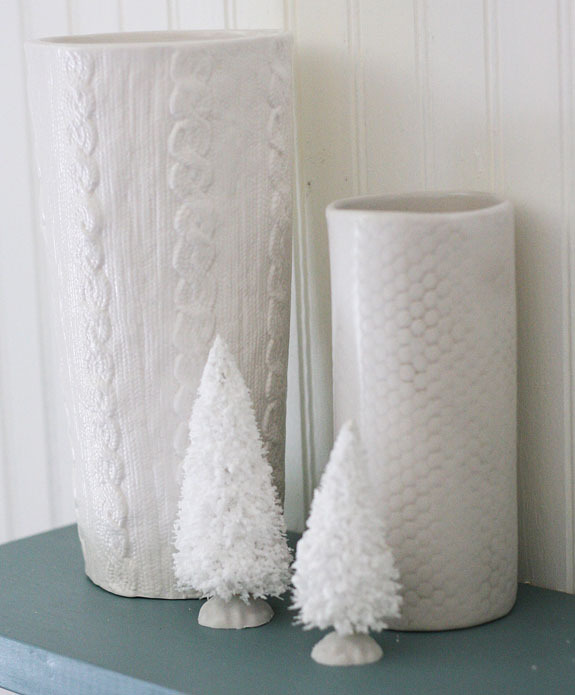 I love white vases because you can use them all year long. Oh, and I tossed in a few of those Dollar Store bottle brush trees just for fun. Speaking of Target, I also picked up some sweet little fake (though realistic looking) succulents from the clearance rack for a song. I think they were about $3 for a pack of 4. 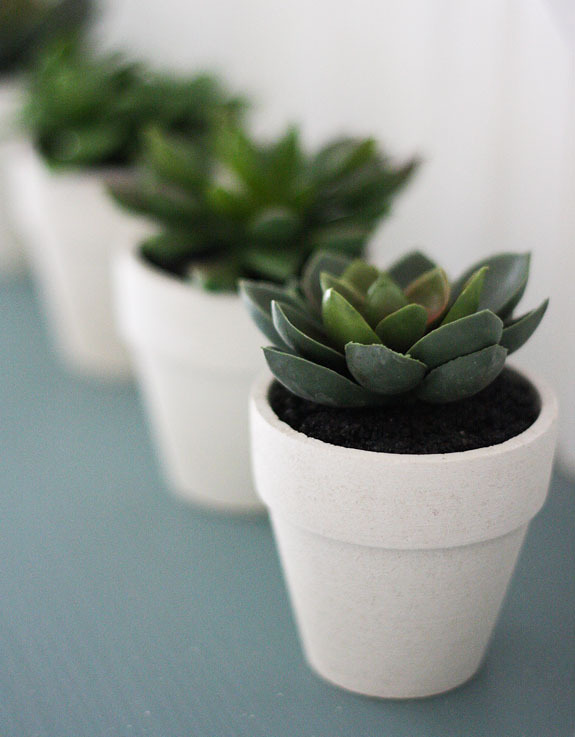 The pots are not stark white, but I still love them. Then I pulled together some “birch bark” candles for this winter mantle. These were so simple that you’re gonna laugh at me. Or with me… or something like that. I just used this print on some paper to wrap around $1 candles in a jar from Dollar Tree and taped them on. See, I told ya it was simple. This is so beautiful! I agree, with so much color during the Christmas season it’s nice to have some clean lines and bright white. I did the same! Also, I love those knit vases! I have been eyeing them at Target waiting for them to go on sale. Ha! Great blog! It’s lovely! I like the succulents from Target; I’ll have to see if I can find those when I go grocery shopping! Clean and simple. I love this pretty look! that just looks so right! Love! White is the perfect colour for the season after Christmas. And your mantle is stunning! You make me want to paint my big red metal star white! And your white birch candle idea is the best I’ve seen yet! So pretty Gina, I just love the white look. Happy New Year! So pretty; I’m ready for some winter white decor. Had to laugh, my youngest daughter (19) is still creeped out by snowmen statues too. Likes the real thing though, but don’t see them too often here in Alabama which is fine by me. Best wishes for 2013. My goodness Gina..are you sure those little plants aren’t real..lol..I have some real ones on a window sill and they look just like them..I also like the birch candle wraps..Enjoy! You have used my favorite color combination, blue and white. It looks lovely. I still haven’t done much except to put my one table top tree away since Christmas. I’m lovin your Winter Whites!!! Your blue fireplace is just beautiful with the whites and little bit of green. Looks so fresh after all the Holiday colors! And talk about LOVIN…those birch candles are amazing, (no laughing going on here) don’t suppose you remember what brand of paper ?????? My mouth dropped open with the birch bark candles. LOVE it! My kind of simple! I reading blogs by the tree and Bubba is downstairs — I can hear him playing his Batman Video game. It makes me smile. So much more peaceful than going out on the town. Happy New Year! Happy New Year Gina’ I think white looks so fresh,especially after the ‘glitz’ of christmas decor* your mantle looks Fab. Great look, Gina! I’m definitely doing the birch bark candle thing — it’s been on my “to do” list for awhile. I’m not an all-white (or cream) type person, but I do like to calm the color a bit after Christmas. Thanks for your inspiration, and Happy New Year! I’ve been looking for birch bark scrapbook paper. Where did you find yours? OMG, love the birch candles. I have been looking for a long time to find out where I can buy birch scraping paper. I hope you can help me. Thanks so much. Great ideas and done beautifully! I’ve got to try those candles, but last time I saw them they were $12. Guess who is going to the dollar store now! BTW I believe mantle should be mantel, just sayin! I really love what you did with your mantal and I have LOTS of fall and Christmas decorations, I am going to Lowes for pastel paints!! Will send pictures—–SOON!! !